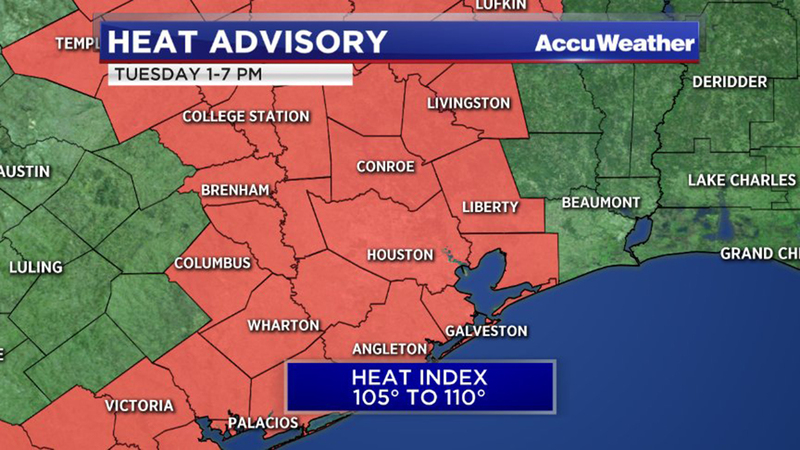 GALVESTON (KTRK) -- Much of southeast Texas is under a Heat Advisory on Tuesday afternoon, the National Weather Service announced. Throughout the abc13 viewing area, temperatures are expected to rise above 100 degrees and humidity will rise, causing heat indices between 105 and 110 degrees. The advisory will last from 1pm to 7pm on August 9. During the heat advisory, strenuous outdoor activities should only occur in the early morning or evening hours. Authorities recommend wearing light and loose fitting clothing and drinking plenty of water when outside. The City of Houston has activated the Heat Emergency Plan and has opened cooling centers throughout the city. For a full list of cooling centers, visit this website. To arrange for free transportation provided by METRO, please call 311 or 713-837-0311.